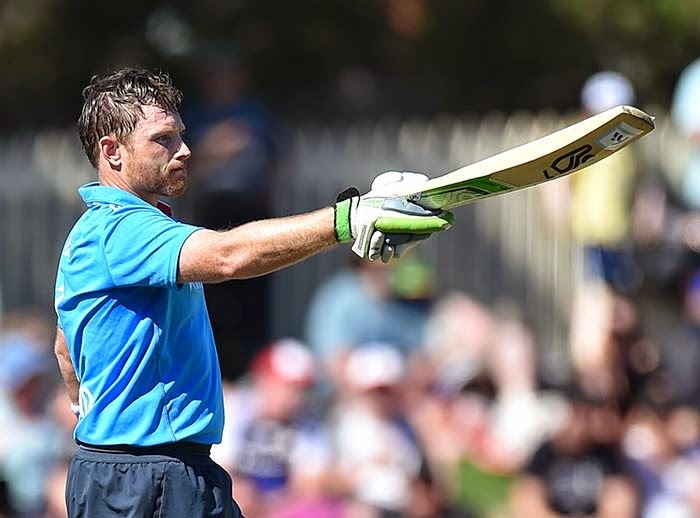 Australia's unbeaten run in the Carlton Mid Tri-Series continued as they triumphed over England with three wickets and one ball to spare at Hobart. Chasing a total of 304, after winning the toss and putting the Three Lions into bat, the Aussie innings was anchored by a thrilling hundred from the stand-in captain Steven Smith. Batting first, the Englishmen got off to a flying start with Ian Bell and Moeen Ali in the middle. In the course of 10 overs of the mandatory powerplay they made 69 runs without losing any wicket. It came as a relief after being reduced for 39 for four wickets in their previous encounter with the hosts. England looked pretty solid with an opening partnership of 113 before Moeen Ali got out in the 18th over mistiming a shot off Faulkner into the hands of the substitute man Doherty. The highlight of Ali's innings came when he exploded three consecutive maximums off Cummins over the midwicket boundary. Ian Bell scored a record breaking 141 off 125 balls after getting out on a golden duck to Starc in the first match. His brilliant innings which although came in a losing cause included 15 fours and 1 six. With shots coming out of his willow fluently it seemed he would score big but he came down the pitch hitting what looked more like a tennis short of Sandhu's slower delivery and missed a well deserved 150 by 9 runs. James Taylor being deceived by Moises Henriques had a yet another dismal outing with a single digit score. Joe Root offered a useful contribution of 69 playing some unorthodox hits over the park. The revelation of a horrifying blackmail plot against Morgan was followed by a golden duck as he nicked a ball off Sandhu into the hands of the wicket keeper, Haddin. The lower middle order did not contribute much with Buttler getting run out scoring 25 and Bopara being bowled out by Starc when he was on just 7. In the last 10 overs the initially blistering English innings seemed to deflate scoring just 59 runs and losing 6 wickets. The Australian bowling card displayed Starc and Cummins with one wicket each in their column but giving away runs at 6.00 and 7.40 runs per over respectively. Gurinder Sandhu was the pick of the bowlers claiming two wickets for 49 runs in his 10 overs. Maxwell's spin bore no fruit as he went wicketless as well as leaked runs. James Faulkner and Henriques had one wicket each to their name as the Aussies ended the first innings with two successive run outs. Going after the target put up by the Three Lions the momentum continued to be with the Aussies with Finch giving a steady start of 76-0 along with Shaun Marsh in the absence of Warner. 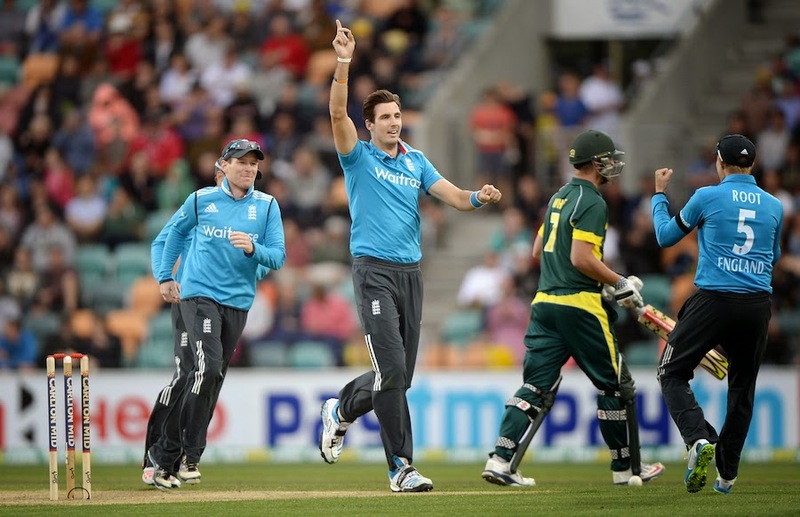 The wicket of Aaron Finch off Moeen Ali was followed by two scalps by Steven Finn reducing the Kangaroo's to 92-3. Cameroon White who came back into the side after four years was one of Finn's prey's. Having hit four 4's Maxwell was going good before he fell to Moeen Ali. Faulkner also fell after scoring 35 runs and sharing the partnership with Smith for the sixth wicket. Haddin and Steven Smith brought back the shaken Aussies on to track after they lost 5 wickets. Smith masterminded the chase with a calm innings of 102 off 95 balls taking his stature up by a notch in international cricket. It seemed Haddin and the stand-in skipper would sail the hosts to yet another victory before the visitors introduced yet another twist in the tail taking the match into the last over. Having lost 7 wickets Starc came out into the middle and took a single off the penultimate delivery as Australians qualified for the Tri-Series final. Moeen Ali was the best bowler for England picking up 2 wickets and giving away 50 runs in his quota of 10 overs. While James Anderson went wicket-less, Chris Woakes took two wickets to his name. Put into bat the English were 20-25 runs short which was a result of the decisive last ten overs of their innings. This sets it up for the rest of the series as the Aussies will have to wait and see who their opponents in the finals would be. Next in the series: Australia play Indian on 26th January, 2015 at the SCG. 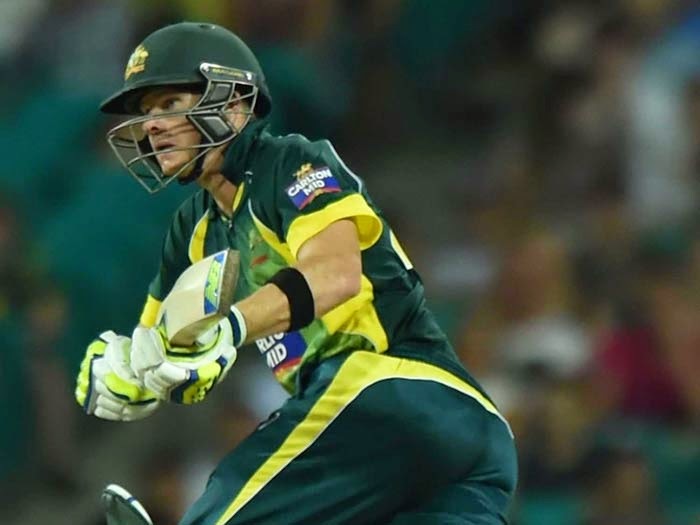 Stand-in captain Steven Smith helps Australia past England in a tri-series thriller.